Jefffrey Herlings is out of the Grand Prix of Great Britain, Lierop and also the Motocross of Nations. MXlarge called KTM today and the news is that Herlings has broken his shoulder blade and will not race again this year. This is a cruel blow for first Herlings, but of course also for the promoters of the Grand Prix of Lierop, and also for the spectators who wanted to attend the last three races of the season. 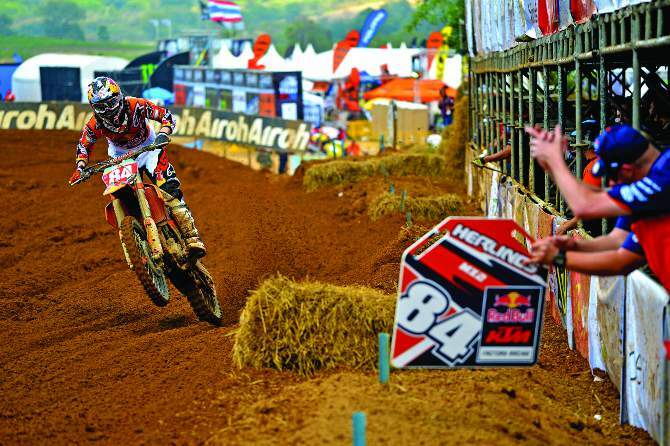 Missing Herlings at the Monster Energy Motocross of Nations is terrible news for all involved. 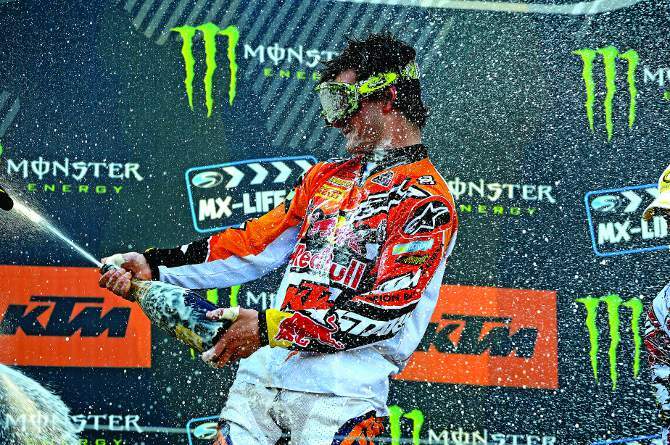 Jeffrey Herlings won the 2013 250 World Championship—and a week later had a season ending injury in Belgium. Known to many in Europe as the “Dutch Sand Master,” the 18-year-old factory KTM rider is the toast of the 250 (MX2) World Championship class. Defending his 2012 crown this year in the Grand Prix series, Jeffrey Herlings is on the fast track to becoming the poster boy of Grand Prix racing—the great white hope, if you will. He is also spoiled, temperamental, undisciplined and full of himself. This comes with the territory when you dominate, can do no wrong and are treated as the crown prince of GP motocross. His flurry of unpredictable antics, foul-mouthed rants and unsportsmanlike take-out moves have cast a shadow over his stellar race results. Oddly, a bad boy might be exactly what the Grand Prix series needs. The GPs are full of sheep, shepherded by the powerful Giuseppe Luongo who leads his flock down whatever path pays him the most money. 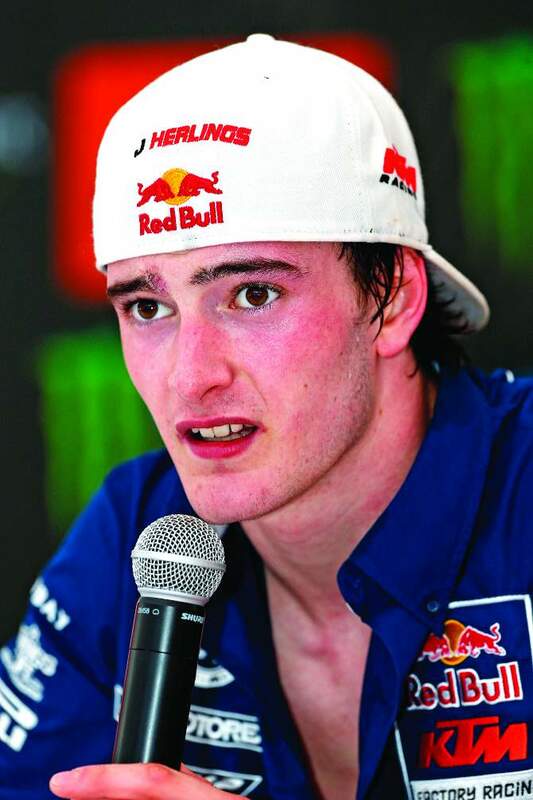 So, maybe if Herlings is the “next big thing,” he could become the voice of the riders. 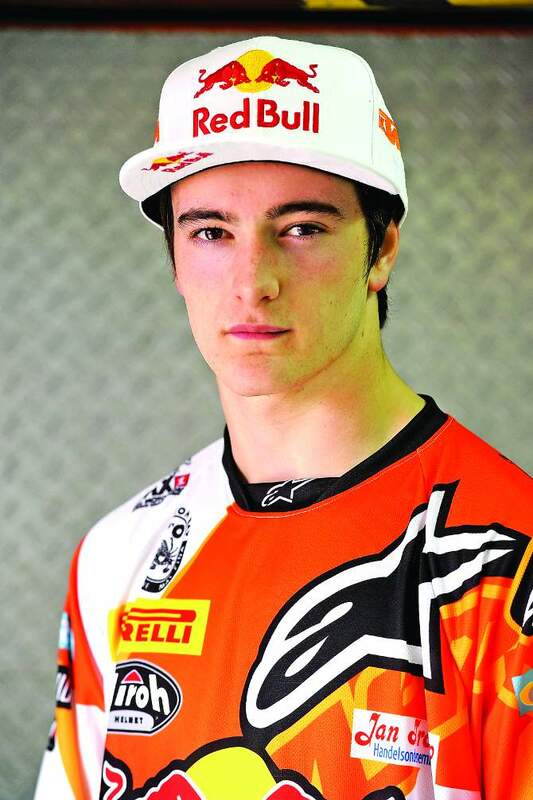 Herlings could be the man who stands up to the mighty Giuseppe Luongo. Evidenced by this interview, Jeffrey just might have the courage to face an evil empire—with a little bit of coaxing. Jeffrey Herlings is the man who would be king of the Grand Prix circuit. We salute him, even if he never sets tires to a track in the U.S.
After last year’s temper tantrums got him in trouble with KTM and the FIM, Jeffrey has turned over a new leaf. He is a kinder, gentler Jeffrey in 2013. DID YOU FEEL ADDED PRESSURE TO WIN THE 250 WORLD CHAMPIONSHIP TITLE AGAIN, ESPECIALLY SINCE ALL YOUR TOUGHEST COMPETITORS WERE FORCED INTO THE MX1 CLASS? Not exactly. I have been showing that I am the fastest guy in the class. I don’t feel much pressure, though. There might be pressure from outside influences, but personally I’m not stressed about anything. I focus on the races and try to keep moving forward. Originally considered a Dutch sand specialist, Jeffrey can win on all kinds of terrain. He is, however, unbeatable on sand. WHAT’S YOUR SECRET FOR RIDING SO WELL IN THE SAND? It depends on the type of sand. 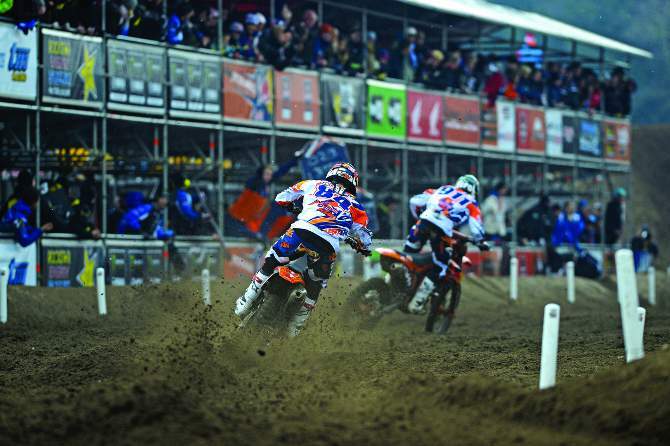 Valkenswaard, for example, doesn’t have very deep or heavy sand. 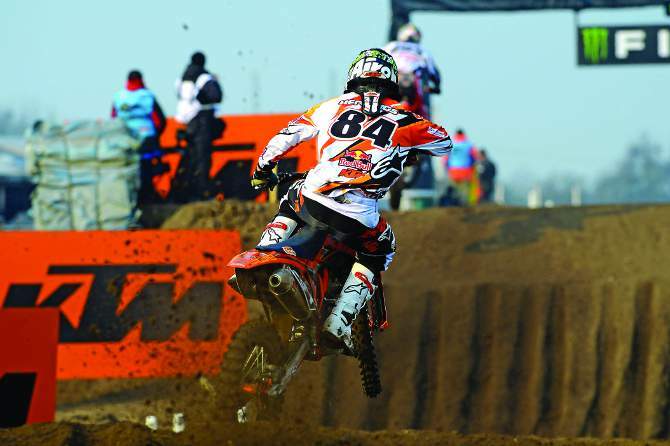 Lierop and Lommel are different stories. They are very challenging tracks. I can’t say that I have a secret to riding in the sand. I believe that the more you train and ride, the better you become. I like sand, because I grew up riding in it. I feel comfortable and familiar with sand, so I have great confidence in that type of condition. It must be nice to know that your pit board always has “#1” written on it. DO YOU HAVE FUTURE PLANS TO RACE IN THE U.S.? For the moment, I am solely focused on European races and the MX2 Championship. I’m not looking for a ride in America right now. I am already signed with KTM in Europe for next year as well. I think that I want to finish my career in Europe, but my mind changes every day. We will have to wait and see what happens. KTM is the powerhouse team of Grand Prix motocross, but teenager Jeffrey is their young hero. He wants to stay in Europe to follow in Stefan Everts’ footsteps. WHAT ARE YOUR THOUGHTS ON SUPERCROSS? Supercross is dangerous. It’s a different type of motocross racing. Obviously, it’s really cool and amazing to see what is done on those tracks. DO YOU HAVE ANY INTEREST IN RACING SUPERCROSS? For me, as a European rider, it’s difficult to adapt to Supercross. I also believe that the racing style is different. I know that I would like to ride Supercross if given the opportunity, and I think that I would do well, but I will stay away from it right now because my focus is on European racing. YOU’VE BEEN KNOWN TO HAVE A GOOD TIME AWAY FROM RACING. HOW DO YOU VIEW LIFE? If I have time away from racing, I go on vacation in some warm country and have some fun. I like to see some nice girls, do some partying and let loose. In the pits, I like to walk around and talk to people. When I’m racing, I’m having a good time. I enjoy what I do, as I should. I’m a professional motocross racer. It’s not a bad career. When Jeffrey moves to the 450 class (probably in 2015), KTM has his replacement already lined up. 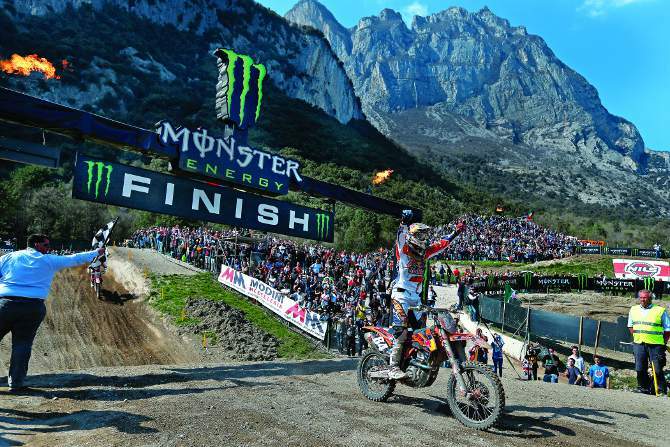 Jordi Tixier (911) is a product of the 125 two-stroke class and will be a contender. WHAT ARE YOUR THOUGHTS ON THE GPs IN QATAR, THAILAND, BRAZIL AND MEXICO? I think the tracks are sometimes nicer than the European rounds, but it’s just so difficult to race in these places because they are so far away. They aren’t easy to get to. Then again, it’s a World Championship and not simply a European Championship. I see why we have to travel around the world to race. WOULD YOU CHOOSE TO RACE IN THOSE PLACES IF YOU WERE IN CHARGE? I will say that if I could choose between 16 races in Europe, or eight in Europe and eight in the rest of the world, I would want all the races in Europe. But it is what it is, and I make the best of it. WHAT DID YOU THINK ABOUT THIS YEAR'S SUPER FINAL RACES? I think the Super Final [where the MX1 and MX2 classes are combined] is really good for the 450 riders, but for the 250 class, it’s very difficult. We don’t get the television coverage because they put the two classes together, and normally the 450 riders are in the top 10. That makes it tough. I believe that the 250 and 450 classes should be separate. Jeffrey thinks the this year's Super Final format at the fly-away races was unfair to 250 riders. WHEN YOU MOVE TO THE 450 CLASS? Last year I rode the KTM 350SXF at the Motocross des Nations. I will make the step up to the big bike either next year or the following year, in 2015. I want to focus on the 250 before my mind wanders to the big bike. I do like the 450. I have shown good speed on the bike, and I think it will be very fun once I race in that class.